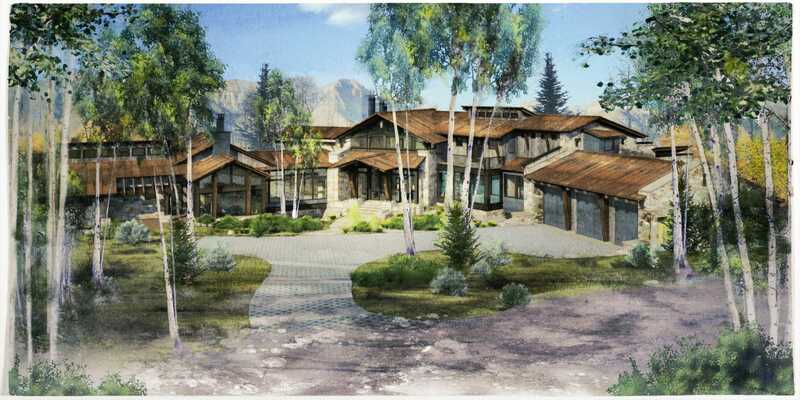 T253B is one of our custom designed residences located in Telluride, Colorado. This project is in currently in construction and really taking shape. The construction photos below show the recent progress of T253B. As the photos and renderings show, this home is taking a more modern mountain architecture aesthetic. This is achieved with the mix of steel structure and timbers, as well as metal roofing, siding and accents on the chimney stacks. A bit of traditional mountain architecture is highlighted through out the design with traditional materials such as stone and rustic wood siding. The glazing implemented throughout the design of this custom home add another aspect of modern design. The mullions and window framing are done in a black, clean lined metal that flows seamlessly with the overall mountain modern aesthetic. Incorporating a lot a glass into the design helps bring in the exterior into the interior of the home. The monoslope roofs of T253B are a modern shape for roofing, that creates simple, unfussy lines and details through out the overall design. Traditional gambled roofs are used to balanced the modern monoslope roofs, creating the Mountain Modern aesthetic. The owner is a fan of the bridge work we have previously designed in past projects. For T253B, we designed two exterior bridges that connect a junior suite and one connecting the garage and mudroom. An interior bridge that in above the entry leads solely to the master bedroom on the upper level. The use of bridges in T253B created a unique shape to the overall design and floor plans.